The Guild of Handicraft Trust was formed in 1990 to preserve, document and help to bring the legacy of craft and design produced in the North Cotswolds, during the twentieth century, to the notice of the public. Material which relates to the Guild of Handicraft is central to the collections of the Trust. The Guild was established in the East End of London in 1888 by the architect and designer Charles Robert Ashbee, a follower of William Morris. The Campden Guild of Handicraft Trust has a significant collection of objects, images, texts and time-based media material associated with the life and work of the Guild of Handicraft. A selection of this work has been made available to the public in a physical form at the Court Barn Museum in Chipping Campden. 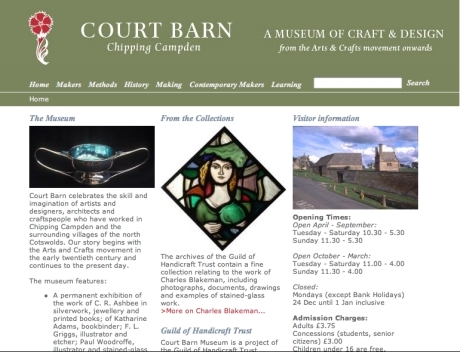 Using System Simulation's ContentIndex+ and MuseumIndex+ products, this work has been made available electronically, both to visitors to the Court Barn museum and to a world audience via the web. The system provides all the management facilities required and provides access to the collections for the general public and scholars.